For two decades, Soheila Azizi has been serving communities within California with her skills in family law, mediation, and more. In total, she has mediated well over 1,000 family law cases and has quickly become a recognized legal expert in the Inland Empire, and is committed to every case she handles. Over the years, Azizi has been recognized for a series of awards, such as the Avvo Client’s Choice Award in 2015 and more. Today we recognize Soheila Azizi for another amazing award she was chosen for. 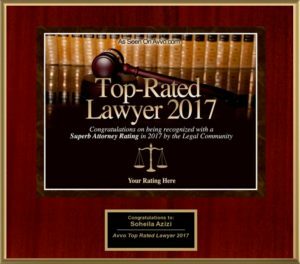 This 2017 year, Soheila Azizi has been recognized as a Top-Rated Lawyer with a Superb Attorney Rating by the Legal Community. This means that she is an Avvo Top Rated Lawyer for 2017, which is a wonderful recognition given to attorneys who are outstanding in their field. Avvo is one of the leading websites for attorneys to go and find information about attorneys as a valid source for various fields. Avvo obtains information from the State Bar Association and uses methods to cover the attorney’s growth through court records, a law firm’s website, and more. Avvo’s rating serves as a way to create an unbiased ranking for those who are interested in a particular type of attorney. Soheila Azizi is an attorney that cares about her community and will handle a wide variety of cases to get the best results for her clients. She believes that family law attorneys should be equipped to handle the expectations of every case, know how to deal with the emotions involved, educate her clients, and so much more. Because of this, she has gained respect in the legal community and will continue to serve clients for years to come. Soheila Azizi is very honored to accept the Top-Rated Lawyer 2017 award and offers a big thank you to all of her clients who have stood by her side.